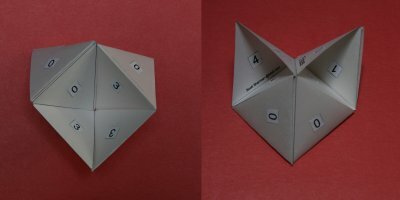 The simplest hexaflexagon the slot flex works on is the 5-sided version. For reference, I’ll refer to the numbering on the braids page. The following steps work with any braid with five or more sides. Start with 0 on one side and 2 on the other. 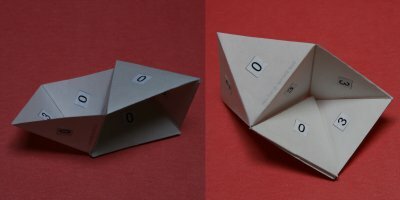 Fold it in half so there are three 0’s on each side. Open up a pocket on either side so you have two pyramids joined by a common side, with all 3’s on the inside of one and all 1’s on the inside of the other. Note that the shared side of the pyramids consists of two leaves. While looking at the inside of the pyramid with the 3’s on the inside, slide the single leaf with a 3 and a 2 on it through the slot between two sides of the pyramid. Pivot the tetrahedron with the 1’s on the inside into the interior of the pyramid. Now push the leaf with the 0 and 1 on it through the same slot. You should now be back to a state where there are two connected pyramids. One will have three 3’s and a 0 on the inside and the other will have 0, 3 and a pair of 4’s on the inside. 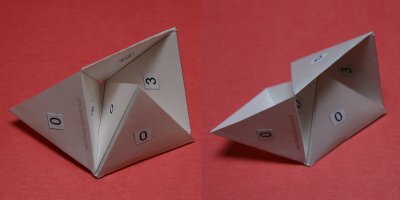 There are two different ways you can fold the 3330 pyramid flat. One way will then allow you to open the flexagon back up to a hexagon. One side of the hexagon will have four 4’s, 0 and 3. The other will have four 0’s, 1 and 2. After you slipped the first leaf through the slot, you could instead do a pyramid flex and end up with interesting new configurations, including a pentagon with a tetrahedron sticking off one leaf. The pentagon can be flexed like a pentaflexagon. The following pictures show one such sequence. Larger hexaflexagons give more to explore. 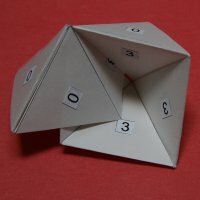 Even the 5-sided hexaflexagon has a dozen different pentagonal arrangements. Here's the state diagram for the 5-sided hexaflexagon using the slot flex.